The completion of this quilt is long overdue. This is my Stitch Tease Bee quilt from 2014, round three, of the bee. 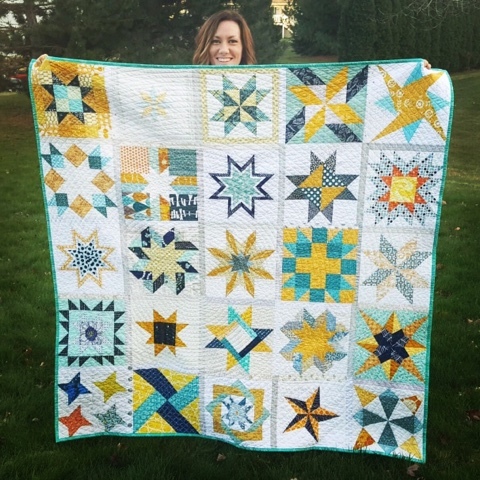 That was the first year I joined the bee, so this is my very first bee quilt, and it is so special to me. 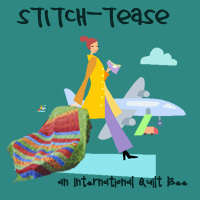 There are twelve of us ladies in the Stitch Tease Bee from the US, Europe, and Africa. I asked them to make two 12" star blocks - any star blocks they wanted - in a specific Design Seeds color palette. They did an amazing job, as always, and I love every block. I quilted this on my Juki 2010Q with my walking foot in a spiral. The back is a vintage sheet. It's so soft and cozy, and the texture from the spiral quilting makes this a great quilt to curl up with on the couch. It's about 64" x 64". This will be one of my treasures. 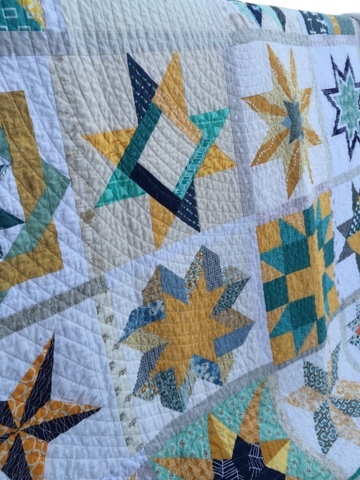 Thanks to all the Stitch Tease ladies who made blocks for this quilt!